Leverage LDC’s proprietary technology, SmartStreetSensor, to host devices and capture pedestrian footfall flows around your stores/locations, or access anonymised data on our entire GB network online through our Footfall Heatmap. LDC’s commercially scalable footfall sensors allow host sites to track the pavement opportunity passing by a location in order to understand hourly, daily, weekly, monthly or yearly fluctuations in footfall density. 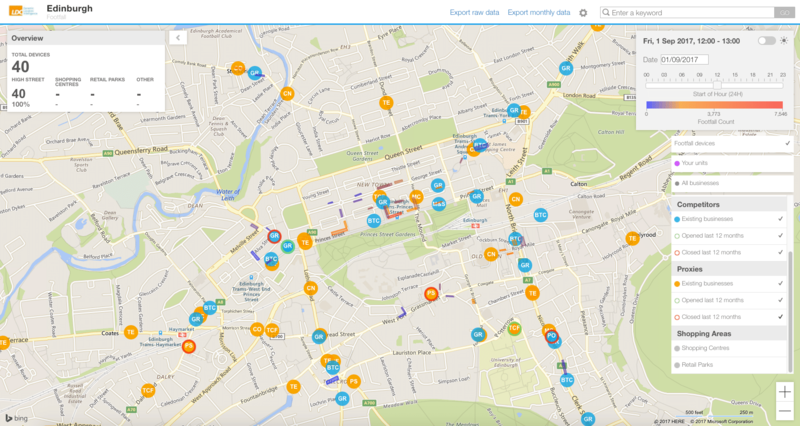 Track the impact of external activity and seasonality on footfall around your estate including weather and local events. Quantify the impact of marketing and promotions across stores/locations with live tracking of store capture rates. Quantify the value and potential impact of an asset’s location and identify the most impactful times to display advertising or deploy field marketing teams. Benchmark store performance based on like-for-like footfall to ensure your stores are performing to their full potential. Compare day and night time economies around your estate to identify new opportunities. Understand trends around key trading hours to inform operational models, e.g. optimistion of stock and staffing levels. Optimise opening hours across your portfolio at store level by proving the opportunity for a store to trade longer or shorter hours. Quantify the impact of local initiatives, events and changes to the environment and retail mix over time by tracking footfall density and flows. Use in conjunction with the Footfall Heatmap to benchmark your estate against competing or similar portfolios, locations or assets. LDC’s online GB Footfall Heatmap enables access to granular footfall data across the entire network of SmartStreetSensors. Which micro-locations/streets enjoy heightened levels of footfall at the most appropriate times for your operating model. Where the best sites are to place field marketing teams, outdoor media or host events within a location and which times are likely to enjoy a higher level of footfall. How many viable assets you can place within a location, dependent on footfall densities and gaps within the retail and/or leisure mix. Where the best locations are to place a new store/asset based on footfall flows and an accurate picture of the local environment including vacant units close by. How footfall trends are impacted by other environmental factors, by layering LDC’s other dynamic data sets including openings and closures, health index, vacancy data and surrounding retail and leisure provision. We can also provide data on our network of sensors, available as an .xls or a .csv file. 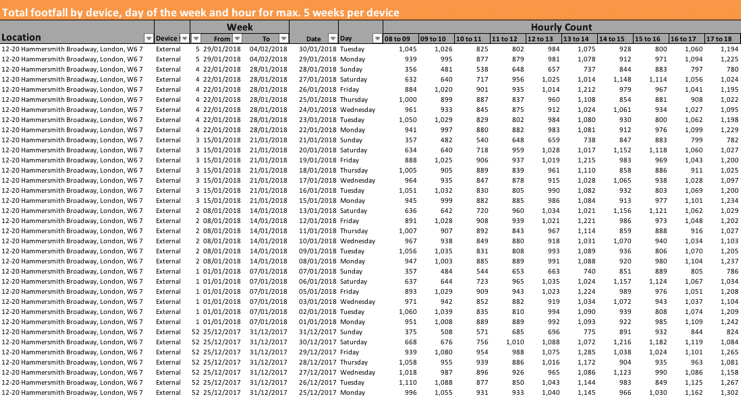 We can segment these footfall counts by hour, day, week or month as required and can provide information split by location in the most appropriate way for your analysis.